Fur Jackets at WeLoveFurs: glamourous styles, fabulously feminine. Jacket with fur hood "Icona"
Extravagant, elegant & totally en vogue. Our glamorous Jacket with Fur hood “Icona” will transform you into a real Style Icon on the coldest of days. This jacket impresses with its feminine design and tailored cut, and its extravagant XXL fur collar. 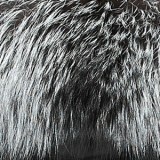 With its glossy outer material, silver zips and maximum size WeLoveFurs XXL fur, “Icona” is pure luxury. Fur lovers and fashionistas. We bring you the ultimate Fur Hood Coat – our new glamour highlight ‘‘Avantgarda“. Inspite of its warm inner lining, this jacket looks amazing with its extremely slim feminine cut and elegant design. The centerpiece of this jacket is its magnificent and maximum sized GreenCollection XXL fur collar, coming from guaranteed sustainable Finnish origin. Super shiny, incredibly glamorous and very warm. You can appear glamorous on the iciest of winter days with our Puffer Jacket with Fur Hood ”IceRed”. A combination of highly glossy red, super feminine design and maximum size XXL fur collar means that this jacket is mega extravagant. Inspite of its extra voluminous down chambers the jacket is cut in a highly tailored way, which makes you look super slim. There are a few winter classics that are timeless. Along with functional Fur Parkas these are definitely sporty, short down jackets with fur hood or elegant down coats with fur. They keep you completely warm, also on the coldest of days, and are also ultra light. "The higher the proportion of fur, the better the quality” is the rule of thumb. Our puffer jackets with fur hood are lined with 80% goose down and 20% feathers, and are therefore in compliance with the strictest quality criterion. This makes them the perfect choice for the coldest of days. Original WeLoveFurs down jackets won’t only please you with their perfect warmth qualities, but also with their super slim cut. All of our puffer jackets and puffer coats are highly insulated and have a super slim cut, so that you are also able to have a glamorous appearance even during the cold of winter. The crowning glory of our down jackets are the unsurpassable XXL Fur Collars. With our money back guarantee we assure you that you won’t be able to find more beautiful or larger fur collars. In terms of sustainability and conservation of resources, regarding the fur collars of most of our down jackets, our GreenCollection Concept applies as follows: the Finnraccoon fur we use comes from state controlled wild stock from Finland and does not necessitate additional animal breeding. The XXL Collars from our collection are comparable with the highest organic quality and are created as carefully as possible. Glamour with a great karma! In order to cater for all tastes, we offer puffer jackets and puffer coats in different lengths. Our short down jacket with fur hood is ultra short and has a super slim cut, and also for many Bloggers such as Hanna Ellen or Ivana Nikola an absolute must-have. For those who prefer to wear longer jackets, we recommend our long down jackets with fur hood “Majestic Black”, which are also cut very slim. Our long down coats with fur hood are an elegant alternative to the jackets and are very becoming with a highly tailored, noble cut. Glamour at its best! The glamourous XXL collars can be taken off of every product, so that the jackets can also be worn on warm days.